Like many other cultures, Russia has its own form of meatballs, tefteli. Ideal for using up leftover meat, bread and vegetables, tefteli are a great winter comfort food. However, as Jennifer Eremeeva discovered, the right choice of ingredients and recipe is crucial when it comes to preparing them. I love our new American Ambassador to Russia — don’t you? He’s so… quiet. He’s never in the news, he doesn’t fight with Russian journalists in the street, and doesn’t tweet. Since being sworn in in July of this year, he’s been silent as the grave and an audible sigh of relief can be heard throughout what’s left of the American community in Moscow. So, as a tribute to Ambassador Tefft, I thought I would make some tefteli, Russia’s beloved meatballs. 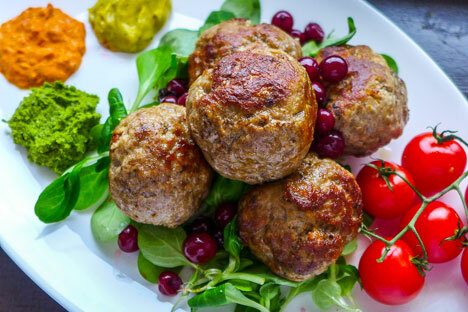 Every cuisine boasts some form of meatball: spicy lamb kibbeh from the Middle East, Guiness-infused Irish meatballs, tangy soy sauce and honey-glazed Korean “rounds,” or those miraculous things they whip out at IKEA just when you are running out of steam. Russia is no exception: Tefteli are a dependable and practical “refrigerator sweep” dish for Slavic homemakers, traditionally clubbed together from leftover scraps of meat and stale bread, as well as any spare vegetables lying around. Across the great expanse of Eastern Europe, regional interpretations vary. In the southern Balkans, rice is used as the starch component, whereas bread soaked in milk becomes more common as one heads north and east into central Russia. There is some confusion about tefteli and what Russians call kotleti. The latter are an interpretation of the culinary definition of “croquettes.” The ingredients are much the same: Ground meat and starch are shaped into round or oval patties. But here the road divides. With tefteli, the starch is incorporated into the patty and fried or steamed; whereas kotleti are dipped in a solution of egg and milk, then rolled in breadcrumbs and fried or baked. The challenge for me is always to discover ways of rescuing these classic Soviet recipes from the twin sins of bad texture and taste, though I had no idea it would take me an entire weekend to hit on the right combination of ingredients and cooking methods. The keys to great tefteli did not reveal themselves immediately. Most of the classic recipes I tried were tough and dry. Good quality meat was a logical start and early on, I realized that I should marinate the meat, to both tenderize it and enhance some of the essential flavors. This worked, particularly as it significantly lowered the amount of cooking time, but something was still off. Frying the tefteli made them tough, whereas steaming them rendered them moist but very bland. After washing a mountain of dishes and doing some soul-searching about why I ever became a food writer, I returned wearily to my research, only to stumble upon a marvelous tefteli recipe from the chef of CookinginRussia. We had a brief, but highly diplomatic exchange on the chat board. Like Ambassador Tefft, the chef is a man of few tweets, but he solved both problems with simple but really effective solutions. One was to both fry AND steam the tefteli (now why didn’t I think of that?). This method gives them a much-needed crunchy fond from the frying and the desired moist tenderness inside from the short steam. Genius! The other informational gem was an innovative approach to cooking onions into almost a jam-like substance. This boosted the flavor to an intense and very specific taste, and I know this is a technique I will use in all kinds of stews and soups in the future. So, many thanks to CookinginRussia, whose many videos I highly recommend. There is a lot to be said for quiet and effective communication when the chips — be they culinary or diplomatic — are down. 1. Slice the meat into chunks and toss these in a non-reactive bowl with the lemon juice, one of the chopped onions, a generous spoonful of salt and several grinds of the pepper mill. Cover and refrigerate for at least three hours, tossing frequently to ensure that the marinade is evenly distributed. 2. Prepare the “onion jam”: Heat 1 tbsp of the vegetable oil, then add the remaining onion. Sauté for a few minutes, then add the baking soda, salt, and sugar and cook over a medium heat for approximately 15 minutes, stirring frequently. The mixture will turn very liquid as the onions dissolve in the solution. Then add the sherry vinegar and cook for an additional 3 minutes. The mixture will darken and take on the consistency of jam. Set aside. 3. Remove the onions from the marinated meat, then pass it through a meat grinder. Note that you can use a food processor for this, but a meat grinder will produce a more pleasing texture. 4. Fold the breadcrumbs, allspice and nutmeg into the “onion jam” then gently fold this mixture into the ground meat using a spatula or wooden spoon. Do not over-process. Cover and chill for 2-3 hours. 5. Combine the flour and cayenne pepper then sprinkle half of the mixture on to a shallow baking pan. Form the meatballs into the approximate size of a walnut, rolling them smooth between the palms of your hands. Immerse your hands into a bowl of cold water frequently to avoid sticking. Place the meatballs on the floured baking sheet, and then dust them with the remaining flour mixture from a small sieve. 6. Heat the remaining vegetable oil in a large sauté pan and then fry the meatballs in batches (so that they are not crowded in the pan) for approximately 10 minutes, turning them gently to ensure that they are crisp on all sides. When both batches are complete, place all of the meatballs in the sauté pan, then pour the chicken stock into the pan, cover, and let steam for 3 minutes. Add the parsley and toss very gently to distribute evenly.